A great way to inspire your kids to read is to start a monthly family book club. It works just like any other monthly book club does but the participants are the members of your family. A family book club is a wonderful opportunity to spend more time together and explore interesting topics. It’s also an opportunity for you to learn more about your child’s thoughts and opinions as you help them develop critical thinking skills. Starting is easy! Just follow these simple steps. First, you need to decide when you will meet. It’s important to figure out the best time for everyone everyone can participate. Take into account the different ages and reading levels of everyone in your family and find ways to ensure everyone can finish the book each month. For example, if any of your children are beginning readers, you or your older children can read the book aloud to them so they can still participate. A monthly book club isn’t a monthly book club if you don’t have proper meetings. The meetings are a crucial part because it’s when you all gather and talk about and share your thoughts on the book, what you liked or disliked. Discussion Questions – Sometimes it’s helpful to have some questions ready in case the book club discussion doesn’t spontaneously take off. Did you like the ending? If not, what do you wish had happened? What did you think was the main point of the story? Was the story believable? Why or why not? What do you think happens next for the characters in the story? How is this book similar to other books you’ve read? What is the most unique aspect of this book? There you have it, that’s how to start a monthly family book club. Now you just have to begin! It really is that simple and I promise that it’ll be fun for the whole family and bring you all closer. Who needs to go through the trouble of setting up an ordinary book club with friends and strangers when you can do it right at home with the people you love. 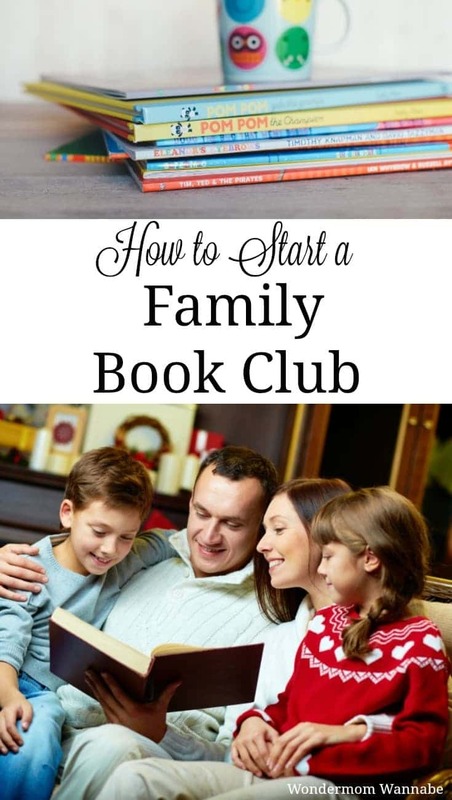 Have you ever thought about starting a monthly book club with your family? Is there anything you’d do differently? Feel free to share in the comments! I love this idea! I already play audio books in the car and we discuss them on the drive but this is a more intentional way to encourage comprehension and cultivate a love for reading.